Lee and Melissa face the age difference issue when all the friends meet while Russell Weller and Peter Montefiorre (from D.A.A.) sleep together. Russell Weller gets his own show and hires Melissa to take his picture for the catalog, then meets Lee over at the apartment. Melissa says that she'll make a set of keys for Lee. At D.A.A., while Melissa is meeting Miles for some project, Russell is introduced to Peter Montefiorre, and they seem to hit it off, talking art and such. Michael had no idea that Peter was gay and is encouraged by Melissa to drop hints to Russell about Peter. Michael fails horribly, and quite amusingly, at the gay locker room talk. After making love, Lee makes motions as if he's not going to spend the night, which throws Melissa off a little bit. This leads to a discussion of whether or not Melissa's friends know about Lee and why hasn't he ever met them. Melissa breaks down and invites him along to Hope and Michael's that upcoming Tuesday. At Russell's, Melissa shoots pictures as he's working and they discuss relationship issues, that she's taking Lee to meet Hope and Michael and that Peter's coming over for dinner at Russell's to talk about the catalog for the show. Both agree to spontaneously suffer headaches. Melissa lingers outside a locksmith's, but doesn't go in. At the dinner party, Melissa has a panic attack when she sees that everyone else has been invited over as well and goes through a hilarious series of waking nightmares, despite everyone's reassurances. Meanwhile, Peter and Russell act a little stiff and awkward, but somehow end up in bed together, talking about various issues. Lee has a great time at the dinner party, but Melissa still seems embarrassed for some reason and he drops her off at the loft in the rain and doesn't come in. The next day, Russell and Melissa have a friendly fight about which picture to pick, and he thinks all of them make him look gay. Melissa presses him for details about Peter and he finally admits that they slept together, but doesn't seem to want to pursue a relationship. Lee comes by the loft and brings dinner to Melissa who is a little withdrawn in her work and is using it as an excuse not to do things together. At the gallery, Melissa runs into Peter and she shows him the pictures of Russell and they agree that the second shoot is a little posed. Lee consults with Ellyn about repainting her apartment. Melissa arranges a very nice dinner at her place, planning to end things with Lee on a platonic note, but he sees right through it. He pushes her to tell him to leave, to say that she's embarrassed of him and afraid of what her friends are thinking. Melissa has a dream in black and white in which she's a boxer, Ellyn is her trainer, Michael is the announcer, Elliot the newscaster. She's fighting herself, her insecurities, and her inability to let herself be happy. Russell and Melissa go over the pictures again and he insists on going with the posed photo. Later, Russell switches and goes with the photo Melissa likes. Melissa has a set of keys made for Lee. Russell drops a catalog off with Peter, invites him to come to the opening, and asks if he can call sometime. Melissa goes to find Lee as he's painting Ellyn's apartment. He's playing it distant a little, but they finally talk, she gives him the keys, says that she loves him, and he reciprocates. This is the episode that caused all the controversy when it came out (so to speak). Lifetime put an adult material label on it "Due to adult themes, viewer discretion is advised"
Opener clip of everyone passing plates around the dinner table. Nicki has written in to observe that the music has changed in the Lifetime version from the first-run episode. The tape that Lee gave to Melissa originally had some neat Robbie Robertson tunes on it, while the current version has basic generic music. It's always possible this is somewhat confused with the Robbie Robertson music that was replaced in "mr. right". "I must admit the first time I saw the edited version of this episode on Lifetime I screamed. They cut the brief - but tender lead-in to the scene in Russell's apartment. As I recall Peter comes in to help Russell with the catalog. Russell shows him some new work and Peter immediately "gets it". He can see right through the paintings into Russell himself. (This is not unlike the moment in "never better" when Billy Sidel shows Ellen that she really can draw.) It is this insight that prompts Russell to put his hand on Peter's chest and ask if that's "OK". "The company originally shot Russell gently moving in to kiss Peter - but the kiss was edited out before the original airing (and has never been shown) and replaced with a hug. Admittedly things are moving fast here - but at least in the original it was somewhat motivated." Ellyn looked quite good in this episode--she wore tan slacks, a black t-shirt with a plaid shirt over it. Most importantly, her hair has finally grown back. Melissa's jacket with the numbers appears. At the dinner party, Melissa has a waking nightmare that Lee acts like a baby and makes childish remarks to everyone there. 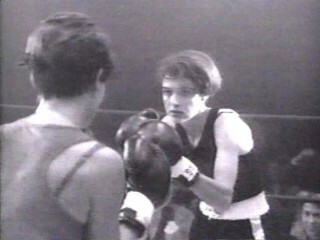 Melissa envisions herself as a boxer with the rest of the cast in supporting roles as she dukes it out with herself in the ring, battling her own conceptions of what she should want in a relationship. [4/29] There is a later reference in "towers of zenith, part one" to viewer groups that can target a show as "impure" so it loses sponsorship. This is probably a reference to the backlash that thirtysomething itself went through when this episode dealt with the homosexual relationship between Peter and Russell. The dinner party was awfully...prompt. I've never been served so quickly. Corey Parker has patented that funny little glance up through his eyelashes at Melissa. The affair between Peter and Russell seemed a little strange to me. There was no chemistry, no passion. They seemed very alone, very isolated, and suddenly they were in bed, and then they were alienated again. I had trouble believing or seeing why they would want to be together. Russell says later, "Melissa, I can take care of myself." But the point is, it isn't about himself, it's about the person he was with. His actions were childish and irresponsible--he hurt someone else and covered it under the guise of looking out for himself.